Here’s a question you won’t hear in the great Canadian board debate: why on earth does anyone want to be a director? The hours are taxing, the material often dreary, and the comp, at least among growth firms, questionable. Not to mention the stress from regulators, the ire of shareholders (activist ones, especially) and some occasional public wrath. Not everyone, for sure. Which is one more reason we need to figure out why Canada is falling short on board diversity. Demand is one side of the problem; supply is the other, and often negated. 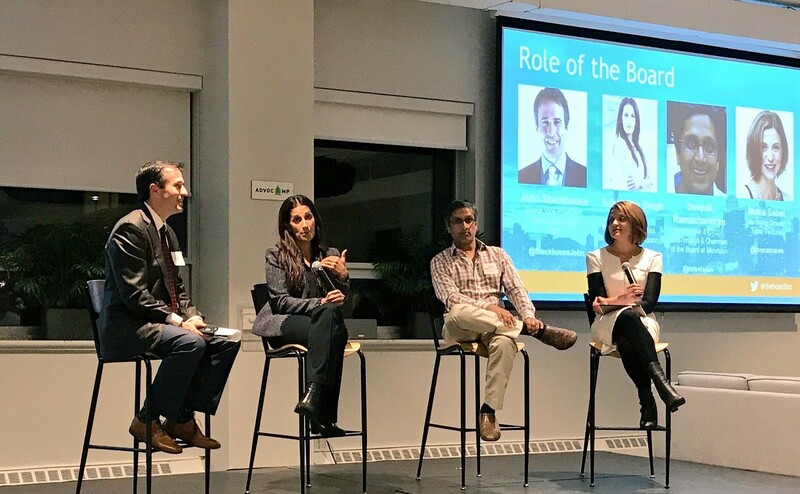 To better understand the supply side challenges of board diversity, I led a discussion on, “The Role of the Board” last week with theBoardList, a Canadian-run group from Silicon Valley that RBC supports to curate private lists of board-eligible women for different sectors and markets, including Canada. Joining me were Sukhinder Singh Cassidy, theBoardlist’s founder; Deepak Ramachandran, a prominent venture capital and tech investor; and Mona Sabet, managing director of Tribal Ventures, an M&A advisory firm in the Valley. So, how can we help more women get to the board list? Cachet aside, boards can be excessive taxes on directors’ time, with weekends and evenings going to prep time, and meetings eating into your day job. For most directors, the benefits make it worthwhile — and it’s not about money or status. Singh Cassidy highlighted the personal fulfillment she finds in helping companies grow, adding jobs and building communities, and helping entrepreneurs succeed. Ramachandran finds board work “exercises a different part of the brain.” Not only does he help entrepreneurs; he finds start-up boards grow his network and expand his influence beyond any one company. 2. What do start-up boards look for? Most directors start with start-up companies and growth firms. Beware: the boards of young, fast-growing companies aren’t just there for the ride. They have to pull their weight plus more, guiding and challenging the CEO while helping firms navigate the strategic landscape, without the resources of bigger firms. Think rowing scull, not racing yacht. 3. What skills are needed most? Effective board members open doors to key business partners, and try to bring specialized knowledge — finance or marketing, usually — to the table. Specialists are most in demand, especially if they can help an audit committee. Oddly, human resources less so. This is particularly strange in light of the general sentiment that talent is a company’s most important asset. 4. Do you look the part? Boards tend to look for new members to fit a certain bill. Perhaps they want a digital thinker. Or someone with social values, or political connections. But don’t think your resume tells the whole story, at least not well. Singh Cassidy said to start by looking at your online headshot (because that’s what search committees and head hunters will see). Do you look digital? 5. Can you play the part? Even if you’re a positon player — the coveted specialist — it may not be enough. A company big enough to have a strong board is big enough to have strong position players — and they’re in management. They don’t need another sales veteran. What they do need is a big thinker, with a curious mind, unafraid to show authority. Are you a thought leader in your field? Have you written or given TED Talks about topics that will excite the room? When a board comes calling, they’ll want to know as much about your influence as your experience. Make sure you have some. 6. Soft hands or sharp elbows? While we push rightly for diversity, boards also need to work as one unit (sculling, remember.) They need to foster debate, but then present as a united front. And they must come together around the ultimate litmus test: the hiring and/or firing of a CEO. “Boards are supposed to question the CEO, which isn’t fun,” Sabet told the room. It’s not an environment that tends to welcome lone wolves, or outliers. It’s a group that needs people who can manage conflict, not add to it. Good boards have lots of debate, and need people who can land the debate without a crash-and-burn. Are you one of those? Can you negotiate, probe, critique and communicate? These same qualities are all the rage in the labour market. Boards are no different. 7. Who’s singing your song? Everyone’s got a rap or two against them. Perhaps it’s moodiness, or an inability to warm up a room. When the search gang digs into your story — and they will — have you established a positive narrative with your network to overshadow any naysaying? Boards are looking for a missing piece to a puzzle. Just because you’re not that piece doesn’t reflect poorly on you as a candidate, it’s just that you may not add the exact qualities they need to make the group whole. Whether it comes down to experience or personality, you may not be the right person. And guess what, they may not be right for you either. “Every Board that wants you, you may not want. Go where the culture fits,” Singh Cassidy said. 9. Can you connect with the CEO? Boards can be full of contradictions. They’re there to keep the CEO, and management, in check. They’re also a CEO’s best source of wisdom, contacts and encouragement, especially for growth firms. “The CEO is looking for someone they can learn from,” Sabet said. She finds women, too often, don’t market themselves as CEO counsellors, instead relegating themselves to the role of position player. Reality is, that’s usually the job of management — or the armies of consultants they can hire. Too many people think they will be recruited for boards solely based on their own merits and experience. In reality, it takes a lot more hustle than that. Are you actively networking with CEOs or other board members? Will you be top of mind — any mind — when an opening emerges? And is your story sufficiently known, so people won’t scratch their heads wondering who you are? Remember, board selection is not like any other recruitment exercise. It’s about team building, balancing power, personal brands and collective wisdom. And a lot of hard work. But find the right fit, and you’ll be hooked.